The airborne particles and toxic chemicals that make up the smog continue to choke more than 20 million residents of the metropolitan city, which recently reported an Air Quality Index of 999, way above the upper limit of the worst category. New Delhi (Sputnik) — In yet another desperate attempt at combating rising pollution, India's national capital New Delhi has picked up a new weapon — the anti-smog gun. Shaped like a giant hair dryer, the device that sprays atomized water into the atmosphere was tested on the streets of Anand Vihar, New Delhi's most polluted area, on Wednesday. Manufactured by Cloud Tech, an Indian company, the canon ejects water at a very high speed to distance up to 50 meters. The idea is that it reduces air pollution by binding dust and other particulate matter and brings them down to the ground level. Connected to a water tank and mounted on a vehicle, the device could be taken across the city to spray water to settle the dust and other suspended particles. Anti-Smog Gun by @AamAadmiParty Government Spraying Water at Anand Vihar ISBT — One of Delhi's pollution hotspots — to improve Air Quality. Presently such machines are being used in mines, thermal power plants and cement plants across the country. "This machine can eject 100 liters water in a minute at a distance of up to 50 meters. The machine can be mounted on a truck, which can roam in the street of Delhi to flush out carcinogen particles," Sushant Saini, managing director of Cloud Tech told Sputnik. The government of Delhi was recently pulled up by the judiciary for failing to curb pollution in the city. Chief Minister Arvind Kejriwal has taken several measures including temporarily shutting down manufacturing units and thermal power plants, as well as restricting the number of motor vehicles plying at a time on the roads with very little impact on the pollution level. 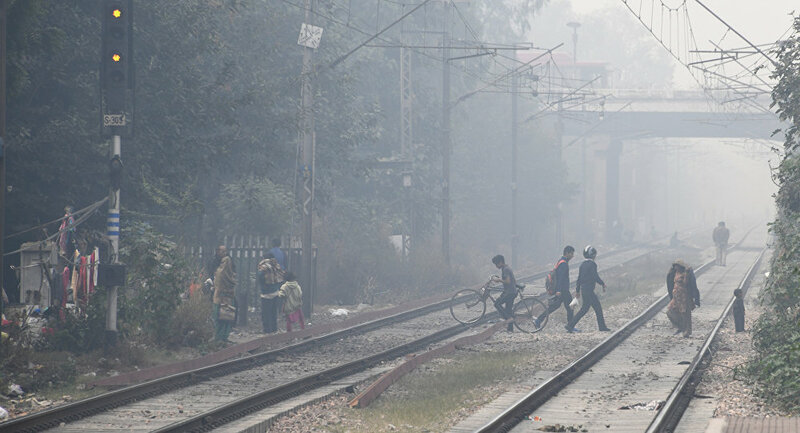 In November, the Indian Medical Association had declared a public health emergency in and around Delhi and had advised citizens to remain inside their homes as much as possible. Clearly miffed at the Indian government's dilly-dallying with regard to pollution, which has reached life-threatening levels, foreign envoys deployed in New Delhi took up the issue with India's Ministry of Foreign Affairs last month with the Dean of the Diplomatic Corps.